George Feldstein has rarely wavered from the very hands-on style of leadership he established when he founded Crestron 40 years ago in northern New Jersey. As he looks to the future, however, he’s going to have more help leading the company he built into a global brand with 91 offices and thousands of employees, Feldstein has named long-time Crestron executive Randy Klein to president and CEO and Dan Feldstein to vice chairman and COO. 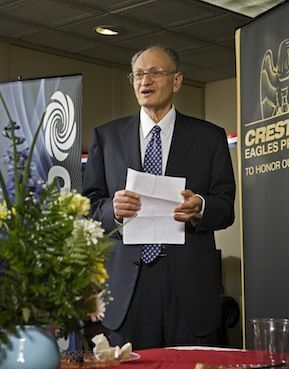 Crestron founder George Feldstein during a Camp Lejeune Eagles donation event. George Feldstein, who previously served as president and CEO, now assumes the role of chairman of the company. Former executive VP Klein has been in the AV and technology industry throughout his professional career, and a member of the Crestron family for 25 years. George’s son Dan has been with Crestron for more than 20 years, most recently serving as VP of operations. With a background in computer engineering, Dan Feldstein spent the first eight years of his Crestron career in R&D, playing a role in designing a number of the company’s technologies. Since then, he has been working directly with his father to manage many of the company’s operations. “Since the day Crestron was founded, we have never wavered from my father’s vision,” Dan Feldstein said. “Randy has always shared that vision and over the years has truly become a member of the family. I can't think of anyone I'd rather work with as we drive Crestron towards the future."